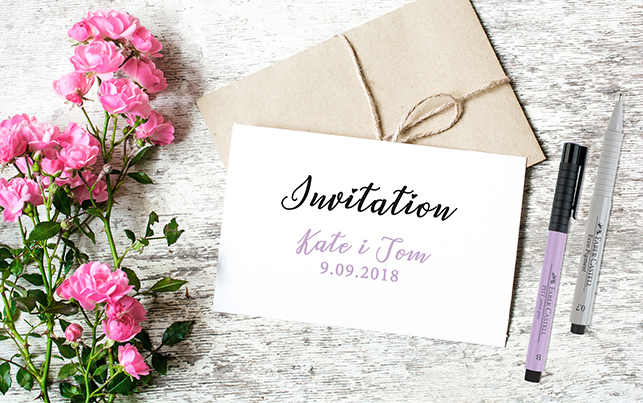 For future spouses, wedding invitations are very often a huge problem – which design should they choose? Should they be hand-made or printed? Personalized or with the same content for everyone? The invitation, on one hand, emphasizes how important the guest is to us (after all, we want him or her to be the witness of the most important event in our life), on the other – it is a preview of beautiful moments and great fun during the wedding party. For this reason, the invitation should be directed to a specific person, so that by reading them he or she could feel that we really care about his or her presence. Our proposal for making special invitations is based on the currently popular technique of handlettering – the art of painting and drawing letters, words and phrases. Brush Pens, Ecco Pigment fineliners, Faber-Castell pencils and pastel textmarkers are ideal for decorative writing, which allow you to achieve extraordinary effects. There is no single recipe how to write properly in handlettering style as it all depends on the author and his imagination. It is worth to sketch the letters gently with a pencil, then correct it with markers or fineliners. All you need to do is practice and the effects will be really impressive! Your wedding invitations will be unique, graceful and extremely personal. Be creative – Do It Yourself with Cricco!